The exhibition catalogue “Sensing Place. 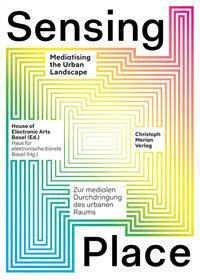 Mediatising the Urban Landscape”, House of electronic Arts Basel, is now available. With theoretical texts by Regine Buschauer, Sabine Himmelsbach, Nicolas Nova und Dietmar Offenhuber; and artistic positions by Timo Arnall, Jorn Knutsen und Einar Sneve Martinussen, Ursula Damm, fabric|ch, Ulrich Fischer, Yolande Harris, Christina Kubisch, Christian Nold, Gordan Savicic, SENSEable City Lab, Mark Shepard und Corinne Studer. Will appear in january 2013 by Christoph Merian Verlag.